I am always looking to in corporate healthier options to the recipes my kid’s love. 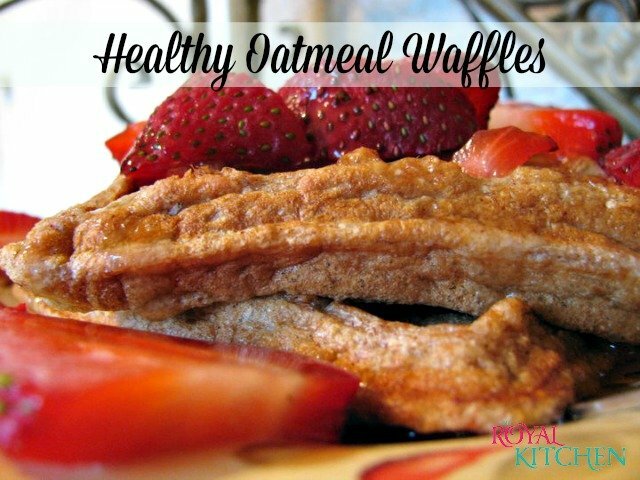 These Healthy Oatmeal Waffles are perfect for any day of the week. I remember as a child spending the night at my grandmothers house and having her make waffles for us grandkids for breakfast. There were sometimes four of us over at a time. She always bought Griffin’s syrup an that is what we grew up on. It’s funny how traditions stick with you because to this day Griffin’s syrup is the only kind I still buy. You could actually top these waffles though with strawberries, blueberries, raspberries or even bananas. This recipe was submitted by our very own Princess Leah. Thanks leah for sharing this with all of our fans. 2 c. buttermilk If you don't have buttermilk just pour 2 tablespoons of white vinegar in a 2 cup measurer and add milk to the 2 c. mark. Let sit 5 minutes and you have buttermilk! Mix eggs and buttermilk together in a large bowl. Add the oats and mix well. Stir in honey, vanilla and oil. Combine dry ingredients together then stir into the egg mixture. If the batter is too thick, thinn with a little milk. Pour about 3/4 c. butter onto a greased, preheated waffle maker. Cook according to manufacturer's directions. Variation: add diced apple or blueberries to the batter before cooking!